This is where Sainsbury's was born, as a small dairy shop. 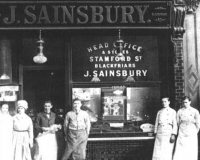 Description: John James Sainsbury and his wife, Mary Ann, began selling butter, milk and eggs from their home here in 1869. The shop was a success and by 1873 they opened another branch in Kentish Town. Their six sons joined the expanding business and the shops now began selling other produce such as cooked meats and smoked hams. Sainsbury also developed the look of his shops. Mosaic floors, green and cream wall tiles, and marble-topped counters. 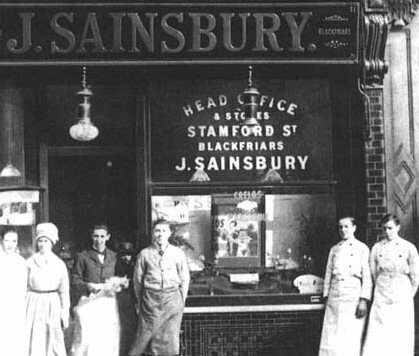 By the time John James Sainsbury died in 1928, he owned over 200 shops in Britain. 173 Drury Lane had five floors which included the shop, an attic and a basement, where the food for the shop was stored. The Sainsbury family's living conditions must have been cramped, as they shared the premises with three other families.